As an adult, this doesn’t really happen to me any more, ever. Children have a way of knowing what your social weaknesses are, and exploiting them mercilessly. In December, TheBloke(TM) and I went to a friend’s house for a party. I have known my friend Janice for years, but this was our first time meeting her partner, Suzanne. We dressed the children up beautifully (despite EldestGirl’s protestations in favour of wearing her My Little Pony leggings), arrived at their lovely home and had a drink with their other guests. “No,” I replied. “Just ‘cat’ at the moment. She doesn’t say anything else, not even ‘Mummy’! She babbles a bit, but nothing really meaningful.” There was a lull in conversation. “GAY,” piped up YoungestGirl loudly and very clearly. Everyone pretended not to hear. “GAY!” she shouted again. It is not just YoungestGirl. EldestGirl has her moments too. She’s generally a well-mannered little thing, so I occasionally let my guard down. This is inevitably when trouble strikes. At our local summer fete, we were standing in a queue to have her face painted. It was a noisy affair, the summer fete: music piped across a PA system, an MC who loved the sound of his own voice a bit too much, fairground rides, bouncy castles, a fire-engine occasionally sounding its sirens for the children. Noisy. “What do you want to be painted as, EldestGirl?” I asked, crouching down to hear her, but already knowing the answer. She is always a tiger. If she isn’t a tiger, she is some sort of superhero. I have never understood why she wants to be a superhero – she has literally never seen a superhero film. I wanted the ground to swallow me up. Molly’s dad, standing with us, hadn’t heard over the noise. Molly had already had her face painted. I had two seconds to sort this out. Oh God, I didn’t want to have this conversation here and now. We had never, I don’t think, discussed race or skin colour at home – she sees a diverse range of people day-to-day and just knows that our friends are our friends, and everyone looks different. I had no idea where this concept had even come from for her. I suspected nursery. Oh, thank God. Molly and EldestGirl happily ran round as BatGirl and BatGirl all afternoon. 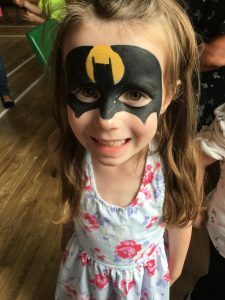 Side “smash the patriarchy” anecdote: EldestGirl wanted to be BatGirl again this weekend at a birthday party with face painting. When she asked the face painting lady if she could be BatGirl, the lady said, “Oh what a shame, a beautiful girl like you wanting to be BatGirl. Wouldn’t you rather be a beautiful princess or a butterfly?” EldestGirl stuck to her guns, and I reinforced how much more interesting it was to be a superhero than a butterfly, and what a great choice she’d made. But still, a shame she’s even hearing these messages. Tell our older grandchild she looks great as Batgirl! Can Grandad be Robin next time? I will ask her. But prepare to be told he has to be Butterfly Girl or TigerBoy. Lois’ favourite t’shirt at the moment is batgirl!!! It’s always so loud and clear, isn’t it, when they say something embarrassing?